This acrylic on canvas (acrílico sobre tela) painting measures 32 centimeters by 42 centimeters. The paintings for Blind Corners, Portals and Turning Points were started in Oaxaca, Mexico in 2010 and were completed in Oregon during 2011. I was inspired by mixtures of ancient and colonial architecture, patterned folk art and the weavings of Zapotec Mexico. Moreover, I sought to instill in the work the distinct mysticism, romance and worldview inherent in that sometimes troubled mestizo culture. 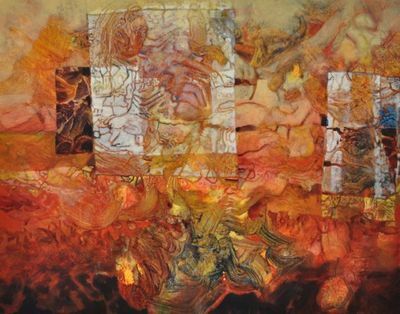 This work appeared in Blind Corners, Portals and Turning Points, an exhibition of paintings by Ronald Mills de Pinyas, at the Linfield Gallery in McMinnville, Oregon. Photograph courtesy of Ronald Mills de Pinyas. Mills de Pinyas, Ronald, "What Moves Unbidden" (2010). Blind Corners, Portals and Turning Points. Image. Submission 16.